While this isn’t the first issue to set up Marvel’s next event, Uncanny Avengers #24 marks the first issue that officially places one of Rick Remender’s titles (who is going to write the event) on the path towards Axis. This is the first issue not directly involved with the excellent Apocalypse Twins/Kang arc that Remender has been writing for over two years. 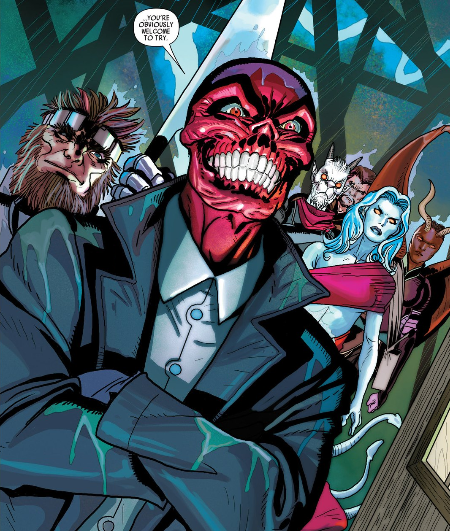 Still picking up the pieces from the major fallout of that story, we revert back to the Red Skull plot point introduced during the first arc of this title (which was great by the way). So how does this title do picking up where the last arc left off and set things up for Marvel’s next event. This issue starts by having Havok dealing with everything that has happened to him during the previous story arc. 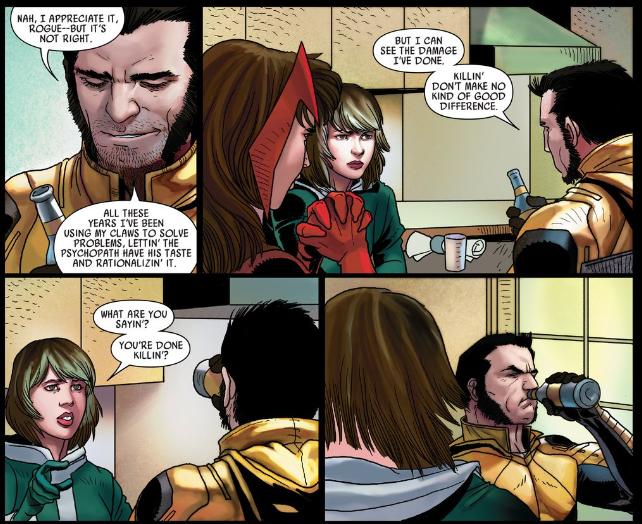 The major change to him involves Havok marrying The Wasp and having a daughter with her. However, she was taken from them by Kang and it appears that they have lost her forever. You can imagine this all weighs very heavily on his mind, but he knows he can make it through everything so long as he has Janet. 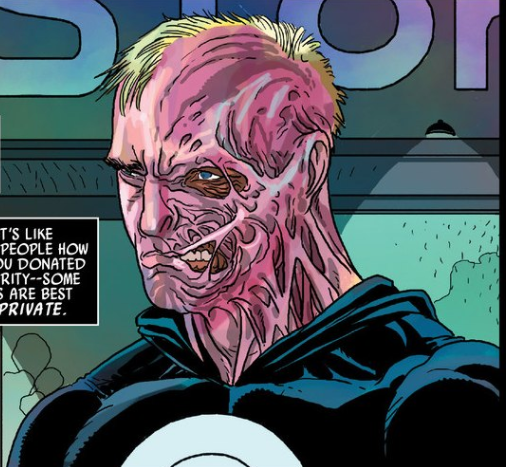 Of course the most obvious thing that happened to him is that the side of face is horribly mutilated. Anyway, Havok gets grabbed by the S-Men and we switch to Rogue, Scarlet Witch, and Wolverine dealing with their own issues that happened last arc. These include Wonder Man (who is in a relationship with Scarlet Witch) being trapped in Rogue’s mind, and Rogue having lost control of her powers again. The plot with Wonder Man is fine, especially since it gives Rogue his powerset, but I don’t like Rogue losing control of her powers again; I liked seeing her being able to borrow just enough from others and even combine powers. We also get to see more development Remender has been doing with Wolverine for a while on this book, which will amount to absolutely nothing soon. Wolverine leaves most likely to do whatever he’s doing in Death of Wolverine, probably not to be seen again for a while in this book. After this overview of the effects that resulted from the last arc, Rogue and Scarlet Witch also get grabbed by the S-Men and wake up in Genosha which has been taken over by The Red Skull and changed into a giant concentration camp. From this point it basically just becomes the characters trying to get out of the camp alive. Overall the story is fine, and does a good job setting things up for this arc. Artwork this issue is done by Salvador Larroca, and while I usually really like his art, it came off as rather weak this issue. That’s not saying it’s bad, just not as good as he has done on this very series. Although there are some panels that are not that good. Uncanny Avengers has been a very good title since its inception as the launch title of Marvel Now! Rick Remender does a good job grounding this story after the cosmic level things that happened last arc, but it does stumble a bit. There’s good character work, and things look like they are about to get very bad for these characters very soon. Unfortunately the art drags this issue down a bit, but this is still a fine issue, and can even be used as a jumping on point for this series.